Only what's necessary, because it works! Drop me a line anytime! In terms of advertising, Facebook has come a long way since its debut in 2004. Facebook has almost single-handedly turned paid social media marketing into a cornerstone of modern digital marketing tactics.In the next year to come, Facebook will evolve in deeper ways to include new features and shifts in the way business will be able to use Facebook advertising to reach prospects. 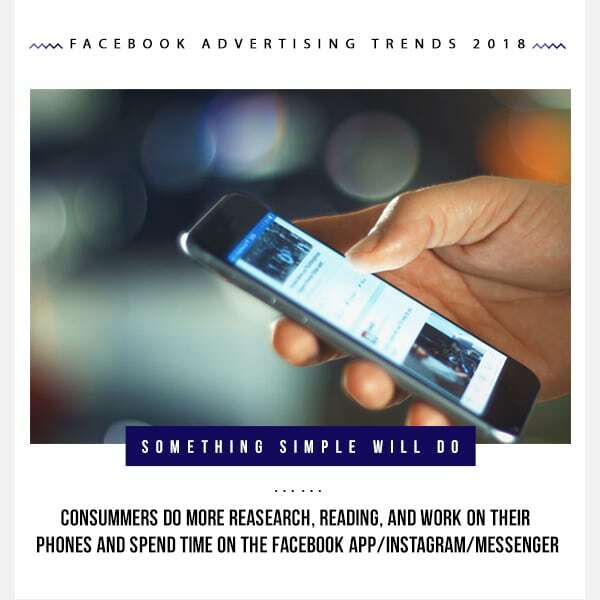 By exploring the most important Facebook advertising trends for 2018, marketers and small business owners can improve their marketing campaigns and hopefully gain more leads in the year to come. How importance are Facebook video ads? Facebook users watch over 100 million hours of video a day, and videos on Facebook get 135% more organic reach than photos on average. Both paid and organic video content erupted as a result of the mobile audiences’ demand and improvements in video players. To improve both its organic reach and engagement on paid posts, marketers and small business owners can create more promotional content as videos. People remember video almost seven-times better than they do with text. 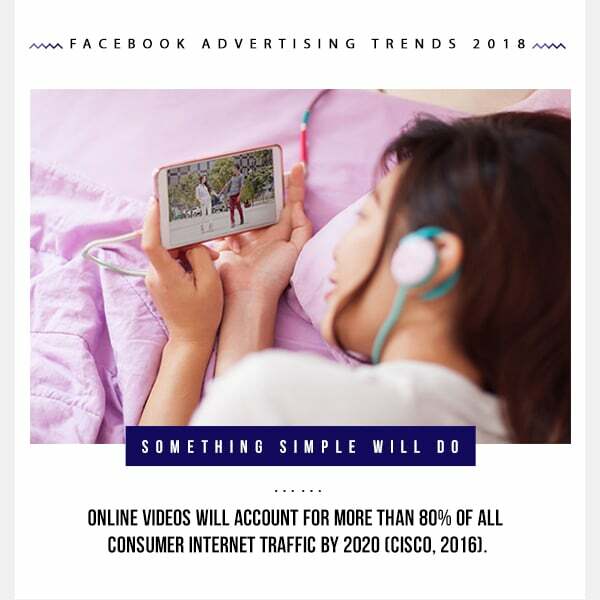 Marketers and small business owners can improve engagement and prospecting with creating just a few Facebook video ads, therefore helping their audience to remember their message. What are more diverse ad types? Facebook has a diversified ad inventory. Marketers and small business owners can use these ad formats to accomplish specific business goals. Carousel ads can use multiple images, multiple offers, or multiple USPs in one go, providing a richer experience and a more compelling CTA. Slideshow ads use lightweight video to load faster and intrude less on the browsing experience. They can be a great transition for small businesses looking to create more video. Collection ads allow users to browse through multiple products or informational pages in-app. This grows awareness while generating less friction compared to an outbound link. Canvas mobile Facebook ad formats transform an ad from a single video or image into a full screen, scrolling experience. They can be used to showcase high-quality assets or nurture prospects further along in the buy cycle. Dynamic ads can use a single ad template to promote several products or create customized pitches for different segments. These ads maximize relevance and returns while helping an A/B test quickler. Link ads include a prominent, customizable CTA button to direct prospects to a landing page or offer. They encourage action, increasing conversions. Lead ads incorporate a lead capture form directly in the app. I’ll explain the significance of this ad type and similar formats below. Understanding and taking advantage of these ad types is beneficial to improve marketing campaigns and gain more leads. Facebook likes to keep users on the Facebook platform. Lead ads and Collection ads keep audiences in-app as they interact with a business’ brand. For instance, Lead ads pull up a lead capture form in-app and autopopulates it with information from the user’s Facebook profile. It reduces friction in a marketing funnel, encouraging more prospects to convert thanks to the simpler process. It also reduces the number of needed assets by getting rid of certain landing pages. Marketers and small business owners will get the most out of their Facebook advertising budget once they understand Facebook goals for their user experience. 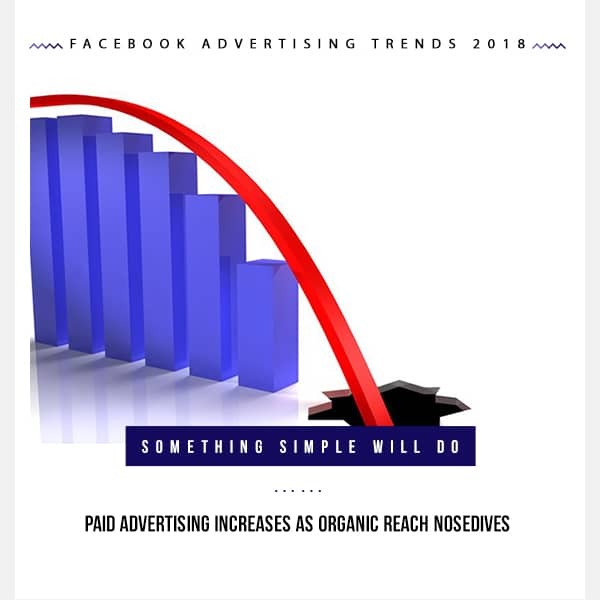 As organic advertising nosedives, paid advertising is on the increase. When Facebook announced they were experimenting with a newsfeed that contained zero organic branded posts and content would be moved to a separate “Explore” feed, it caused a bit of controversy. 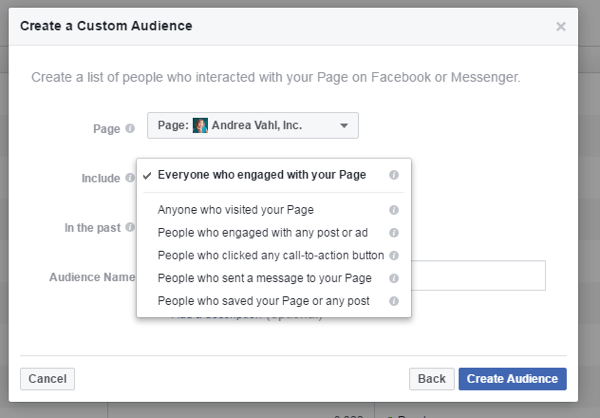 If Facebook implements this change globally, then all branded Facebook Pages will see their organic reach tank. Even if that doesn’t happen, though, these Pages have already seen dramatic drops in reach over the past few years. With fewer people seeing their content appear on its own, these Pages must now resort to funding paid Facebook advertising campaigns in order to generate impressions. Truth be told: this has been the situation for years. Marketers and small business owners simply cannot rely on the Facebook algorithm to show their content to meet their business goals. Funding a paid ad or promoted post campaign is more likely to guarantee a sizeable audience. Fine-tuning the targeting for the ads to maximize relevance and ROI is even better. Facebook has gotten much more granular with its targeting features. These features will help marketers and small business owners weed out audiences who are unlikely to buy their products/services, increasing conversion rate and overall returns. In order to reach better targeted audiences on Facebook, marketers and small business owners must embrace paid advertising. 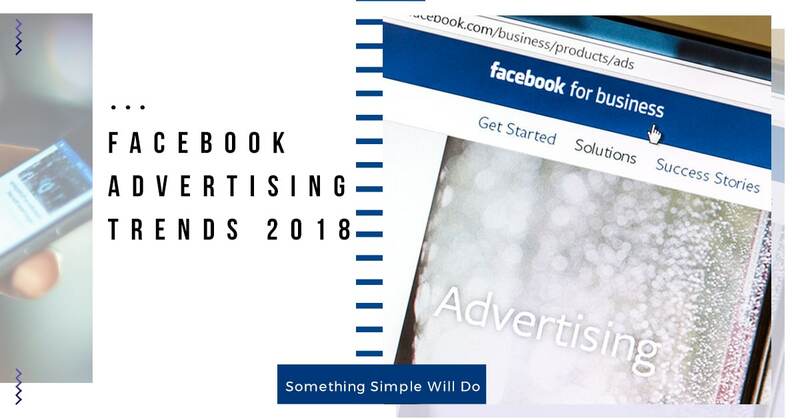 Taking advantage of Facebook advertising trends in 2018 and beyond. By considering the above Facebook Advertising trends, marketers and small business owners can find greater success in reaching ideal prospects to grow in 2018. Facebook Advertising strategy combined with other digital marketing practices is the best route for maximum gains.